Kelli and Murphy the Red-tailed Hawk went to Georgetown, and were popular with the high-country crowds. They earned HH&H a very nice write-up in the Georgetown Gazette, which featured Murphy’s West Nile Virus survival story. Murphy is turning into our Poster Child for WNV – the hopeful side. Few birds survive this disease, and those who do almost always have moderate to severe side-effects. Yet Murphy, who wears her disabilities well, comes across to audiences as exactly what she is: great-hearted and beautiful. She shows us what a handler’s devotion and an animal’s determination can accomplish despite serious odds. Murphy will never be completely “cured.” She will have the effects of the virus for the rest of her life – compromised vision and balance. But with Kelli’s support, she is calm in front of people, dogs, cars, whatever she is asked to do. She is the very wonderful face of HH&H. A large and enthusiastic HH&H team went to Walk on the Wild Side – Kelli and Murphy, of course. Sallie took Bolt, the Peregrine Falcon. 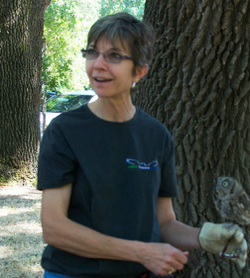 Kelli and Dr. Carol also took Clicky, the Western Screech Owl, and introduced our newest member, Digger, the Burrowing Owl. Our Board Members, Tracy Langlands and Becky Kirsch also came and worked very hard to make our presentation a success. Becky brought Maggie, her three-year-old daughter – kids are what these festivals are all about, really. Kids of all ages love critters and the great outdoors. That includes us! We all had great fun. This festival was wonderful. The audiences were attentive and appreciative and the setting was idyllic – an oak grove near the river, where the exhibitors had shade and plenty of space. Indeed, right over our booth, we spotted a Great Horned Owl’s nest with three curious fuzzies peeking down at us. A group of birders found the parents hiding, but keeping a weather eye on things and discouraging a harassing flock of crows.The exhibitors included other wildlife groups, including Save Our Sandhill Cranes, whose photos and CDs remind us of those magnificent winter visitors. Several inspiring artists displayed their work, in painting and metal. The crowd was enjoying the celebration of earth, air, water, and critters. We showed four birds: A broadly smiling Dr. Carol presented Clicky; Tracy held first Bolt and later Clicky on the glove, and told groups of interested folks all about them. Bolt and Clicky’s original trainer, Sherrill Cook, from the Lindsay Wildlife Museum, got to say hello to them and show them off for awhile as well. Kelli got Murphy out and she stayed out for nearly four hours! As always, Murphy drew an awed crowd. To introduce Digger, Sallie got him out of his travel carrier a few times. But no way was he going to stand on the fist that day! Too many people, he seemed to say, too much excitement. So we quickly put him back in his safe little haven. We’ll keep working with Digger. He’s new to the game and came to us as an adult. These older birds often take longer to settle down than young ones. And don’t forget: No bird in an education program is able to survive in the wild. They are not pets. They are brave survivors, and their handlers respect their short-comings even as they celebrate their wonders.